According to an old English proverb, A man is known by the company he keeps. On Facebook, some police officers are keeping company they wouldn’t otherwise keep. Some officers, the same ones who guard themselves, their families and colleagues diligently day in and day out are behaving as though they’ve forgotten they work in one of the most dangerous professions there is. On Facebook, the tables have been turned on law officers. All those social engineering techniques police investigators do to ferret out pedophiles and gang-bangers with fake profiles in social media are also being used by cop haters to gain intelligence about cops. People who would want to harm police officers are creating profiles to look like cops, and officers are friending them in the same way they’d have a buddy over for dinner, opening the front door and saying “come on in”. There is no telltale sign that a profile on Facebook that appears to be a police officer is not really a police officer. It’s a combination of things that gives us reason to believe a profile might be phony. But those same reasons might also be interpreted as signs of a cop trying to protect his identity. Things like vague references to one’s employer, a profile photo depicting an eagle, the flag or even Jesus, are all prevalent on these fake profiles. Look at the photo albums and there are rarely photos of real people. Instead we see images including cartoon characters, logos, random military and police photos. 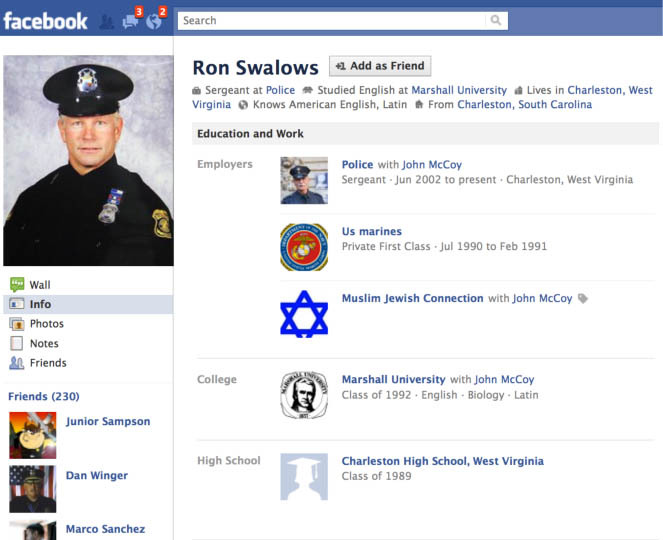 One profile we know to have been fake is that of “Ron Swalows”. Have your laugh at the name and then, please take this seriously. 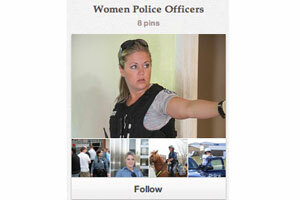 It’s a believable cop profile because in this case, there’s a photo of a real cop in uniform. Close inspection will show (look just under his name) that he works for “Police”. Upon clicking on that link we saw a wikipedia-looking page defining a police officer rather than a link to a department page. Facebook told me how many mutual friends we had. I emailed a couple of those friends, real friends I know in real life that are law officers. I emailed them to ask what they knew about Mr. Swalows. Their response was along the lines of “I don’t know him but he posts all the time in a group I’m in and he seems like a really nice guy”. Folks, that’s part of the ruse. Isn’t that what you do when you’re pretending to be a 15 year old hottie with cleavage who likes bad boys? The only way we knew for certain that this profile was fake was because we saw that the photo used was that of Larry Nehasil, an officer who was gunned-down in Livonia, Michigan in January of 2011. 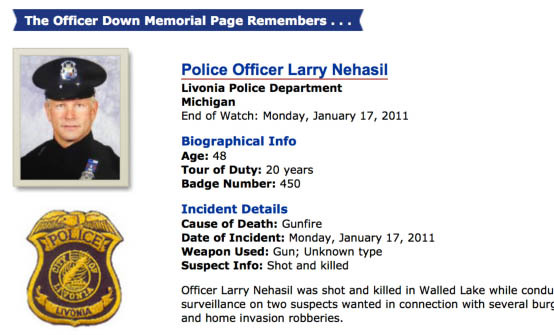 Here’s Officer Nehasil’s profile on the Officer Down Memorial Page. The only way to guard oneself from these predators – and they are predators – is to be absolutely certain that everyone you friend on Facebook is someone you KNOW is real. They may not be holding a gun to your head but that doesn’t mean they aren’t wishing to harm you just because you wear a uniform. It also doesn’t mean that they’re not just as dangerous as a loaded round headed in your direction. Rest assured there is no Kevlar vest to protect you on Facebook. Your only protection is not to act carelessly. You must keep your guard up just as you are trained to do on the job. When was the last time someone brought up Twitter or Facebook in a conversation about cops using either when what followed wasn’t something negative? We’ve all heard the negative stories about police use of social media and it’s time we start hearing more about the positive outcomes of police use of social media. LAwS Communications is producing the ConnectedCOPS™ Awards to recognize and celebrate the incredibly great work being done by law enforcement agencies and law officers all over the planet. Nominations are open through May 31st. Judging will take place in June and July and winners will be notified in early August. Our award sponsors are Nixle and LexisNexis. We have four more spots for sponsorships, contact LAwS Communications for more information about sponsorship. Terms and conditions for the awards are spelled out here. International acknowledgement of their achievement in partnering media publications. To nominate an agency or law officer, go to the ConnectedCOPS Awards webpage. This award is given to a law enforcement agency, anywhere in the world, of 151 sworn officers or more that has demonstrated overall excellence in the use of social media to enhance its services to the public. The agency exhibits leadership, creativity and innovation in its use of social media to engage, educate, recruit, and etc. The agency has a broad and deep understanding of social media use and applies sound governance and strategy in its social media operations. The agency also promotes the use of social networking in law enforcement through its outreach to colleagues and by mentoring others. The nominee for this award must be a law enforcement AGENCY. This award is given to the individual sworn officer up to and including the rank of Sergeant (or its international equivalent) at any worldwide law enforcement agency who has singularly demonstrated exemplary and selfless leadership in the use of social media to improve public safety and/or enhance his or her agency’s community engagement and reputation. This individual is creative, innovative and fearless and shares what s/he knows by mentoring others, participating in public speaking opportunities and leading by example. The nominee for this award must be an individual law enforcement officer. This award is given to the sworn law enforcement executive of the rank of LT (or its international equivalent) and up, at any worldwide law enforcement agency who has demonstrated significant and sustained executive leadership to further the use of social media and Internet technologies in law enforcement. This individual is a risk-taker and a pioneer in his or her promotion and use of social media in policing. The recipient of the Top Cop Award also gives his thought leadership and expertise freely to others. This award is given to the sworn law enforcement investigator at any worldwide law enforcement agency who, as a practitioner, has used social media successfully to solve crime. The Social Media Investigator practices appropriate security measures and supervision in his/her investigations. This award is given to the sworn law enforcement officer or agency anywhere in the world who has used social media to manage and/or influence a public safety/emergency event, whether unforeseen or known. This officer/agency has strategically and successfully implemented social media engagement techniques to positively and effectively communicate public safety information in an urgent or emergency situation. The nominee for this award can be a law enforcement agency OR individual law enforcement professional to include civilians. Whether or not to recommend law enforcement agencies embrace Google+ is something I’ve struggled with for some time. I’m a huge proponent of “fish where the fish are” when devising a social media strategy. On one hand, the number of Google+ users (175 million) is still far fewer than Facebook’s (850 million), but numbers alone never tell the whole story. Google has been creating a lot of buzz lately with its efforts to consolidate its various offerings into a more user-friendly all-on-one network. But perhaps the best reason to now recommend law enforcement take a look at Google+ is Google Hangouts on Air (HOA). 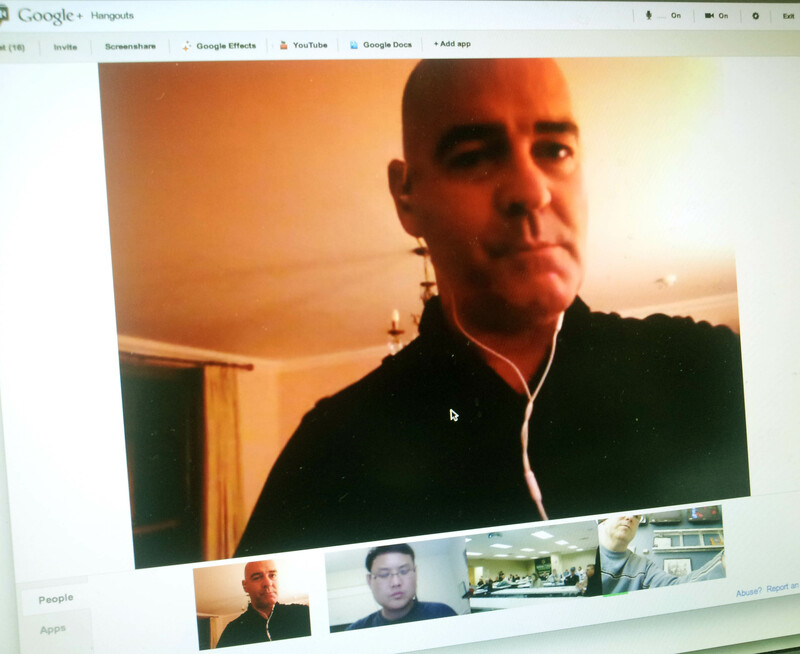 A hangout is G+’s video conferencing feature which allows up to 10 users to chat with video. But Hangouts on Air, which was released to the masses this week, allows the host to broadcast the hangout, live, on YouTube. Add to the equation that YouTube has 800M user accounts and 4 billion page views per day, this HOA thing is worth paying (a lot of) attention to. Streaming video used to be cumbersome and require the use of a Livestream or Ustream account. With HOA, you need only a Google+ account enabled with HOA and a linked YouTube account. Hangouts use for LE ranges from enhancing internal communications by using it for online meetings with your own staff or police leaders in different geographies, to live broadcast and recording/archiving of press conferences and events. In addition to streaming on YouTube, embed the broadcast to stream on a PD website. Getting started with HOA is easy and Google itself has created a .pdf technical guide. In the past two weeks, I participated in several hangouts with law enforcement and community members. In each, at least three countries were represented. Think of how useful this could be for law enforcement, whether your hangout is public (with HOA) or private. This Social Media QuickTip was previously published at LawOfficer.com. Police departments are constantly struggling to get the local media to report on topics that, in spite of their best efforts, still go uncovered and they’re frustrated that when they do gain media attention, the story is often reported, well, not quite right. The latest department to up the ante using open source technology and move more towards providing its own news is the Milwaukee Police Department (MPD), and the local media are less than thrilled about it. We’ll correct the news stories that got it wrong and highlight the ones that got it right. …. 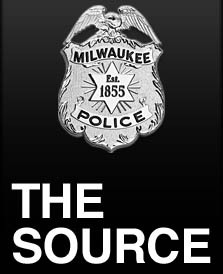 We encourage you to check back to The Source at www.milwaukeepolicenews.com when you hear news reports that prompt you to seek more information. We’d like you to check us out first, because we will provide the news to you at the same time we’re providing it to the media. It’s not only about generating their own news but PD’s are also having to work more efficiently during a time when most are facing cuts to their ranks. Some might think that MPD is acting progressively and efficiently, but the Milwaukee Journal Sentinel isn’t seeing it that way. It an editorial entitled The bunker at the Milwaukee Police Department the Journal said to expect to hear from the MPD about “what a great job officers are doing” in The Source and updates about “when the next bake sale will be held.” The paper compared the MPD to the Pravda, of the [former] Soviet Union.